All upgrades, minor as well as major ones, are free, you only buy this software once! THANK YOU very much to bh77a, JoeV and Khertan for sharing their "PP applets"
The limitations of the trial version are very light, so as not to stop you from using iziBasic if you like it and cannot afford to buy it. 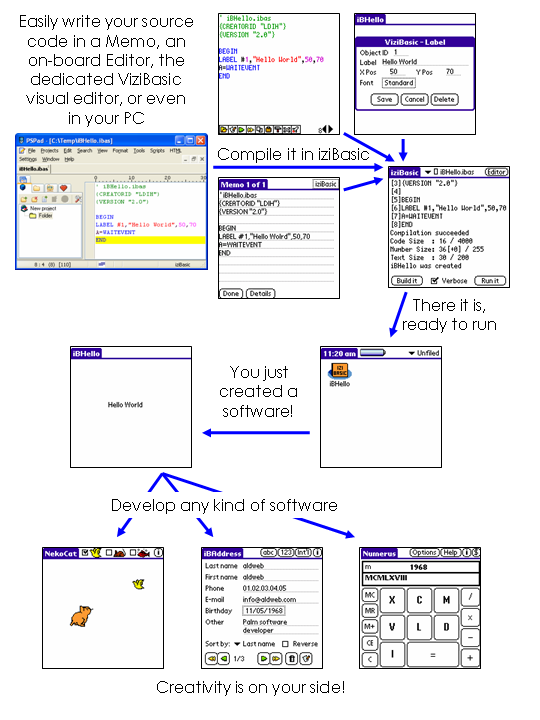 For instance, there is no time limit and you can very well use iziBasic without any time restriction. But you are encouraged to support this shareware and buy it. How to buy the full version of iziBasic? Thanks to go to this page. 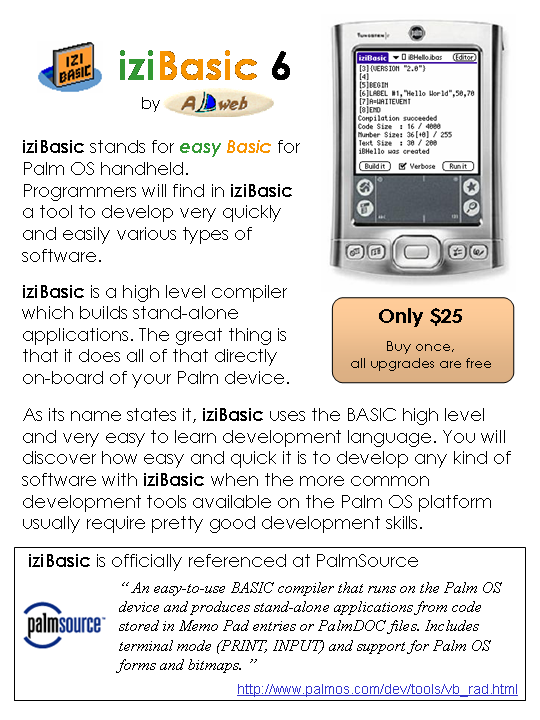 Hi, Where I can buy iziBasic?, I try to buy in pdassi, but nobody responds, another option?, thanks. The full version of iziBasic is not found on any of the three pages you listed for purchase options. Is there any other option? What you ask for can of course be coded with iziBasic. But, you will not find a high level form/database statement or function in iziBasic to do it. Overall, the coding principles are the same in iziBasic as in OnBoardC, PP Pascal, and most other development tools, but usually easier to code because the low level coding required in the other tools for file manipulation or form rendering are managed by iziBasic's runtime engine. You should, at this stage, give a look to the source code of iBAddress to understand what I mean. e.g. Your sample application 'iBAddress' has its main-database. Can we do the following with izibasic: We make another form that displays a table whose columns are only for LastName, FirstName, and Phone Fields (with filtering if possible). This form has its own database so we can set the 'SaveState' for the table displayed. It is the code for that table which I want to see. I can't find it in the manual.